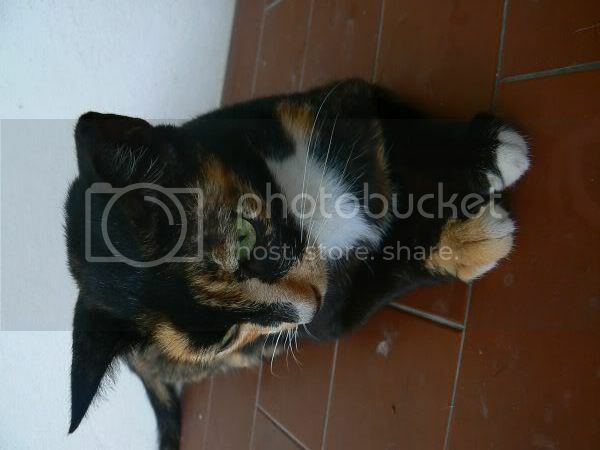 I thought I'll share more pictures of the cute calico cat which comes over to the house for her meals. She's getting friendlier probably because she knows what good food she gets. Nowadays she even hangs out at the house 24 hours rather than run and hide somewhere in between meal times. She's not too good with posing yet and it's still kinda difficult to take nice pictures of her since she won't really sit down for long. I love her sleek fur as it's very short plus close to her body. She's also has these adorable markings like white socks on her two front paws while the back paws are black. 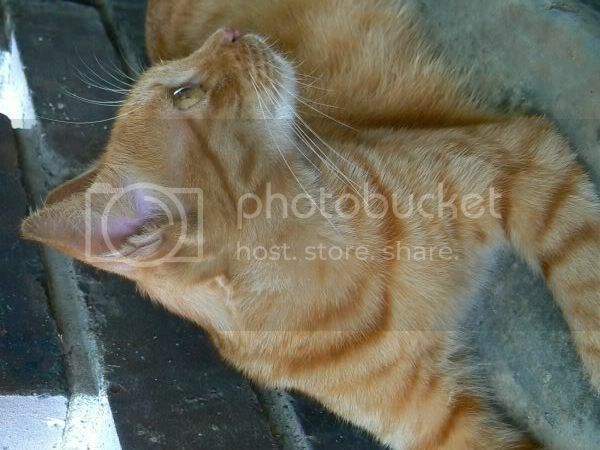 Another amazing discovery I made this week was she's a great pal of the male stray cat who often fights with my cats. With her, he is all sweet and lovey dovey. He lets her share his bowl of cat food. I suspect they could be siblings or related since he is so relaxed with her. If you have any kitty pictures, do share it with all of us in Weekend Cat Blogging. This weekend, it's hosted by the adorable Bengals of Pet's Garden Blog. Pop by and say hi to everyone as the felines are all out on show this weekend. I'm currently in LOVE with my new Dorie Greenspan cookbook, Baking from My Home to Yours. Everyday, I thumb through it looking for something new to try - most of the time they're just dreams but some do turn into reality like the Chocolate Chocolate Cupcakes, Flaky Apple Turnovers and now the tart of my dreams. I'm kinda hopeless when it comes to pies and tarts probably because I don't make enough to practise hence I wanted to try this Lemon Cream Tart real badly. I was tempted to make it but lacked a candy thermometer which is a must for the lemon cream. Not sure why but bake shops in Kuala Lumpur don't seem to readily stock the thermometer. Thus when I spied one at Pantry Magic in Singapore, I quickly grabbed it and vowed to make this tart as soon as possible. Once you have the thermometer, making the lemon cream is a breeze. All it needs is patience, an essential ingredient in baking and cooking to make it work. I used a blender to add the butter which was really easy and left it in the fridge overnight for the flavours to develop. Whip it up the next day in a bowl and spoon it in a pre-baked tart shell of your choice. The cream was so light with a clean lemon flavour. Not too sour and utterly delectable. We were meant to share the small tart in the first picture but I ended up eating almost all of it as I couldn't stop myself. 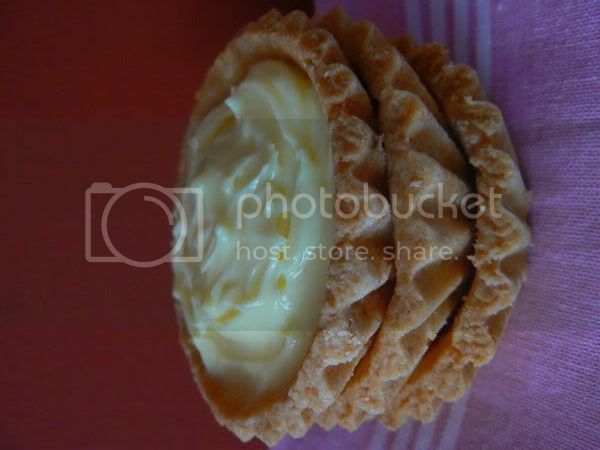 I also played around with different tart shells in the pictures. The first one is my own tart shell made from a recipe from Dorie Greenspan's cookbook. It was also easy to make and so light plus crumbly. To test the tart dough, I had made them with small tart pans versus a 9 inch tart pan. I only baked two tart shells while the other two have been kept in the freezer for later. 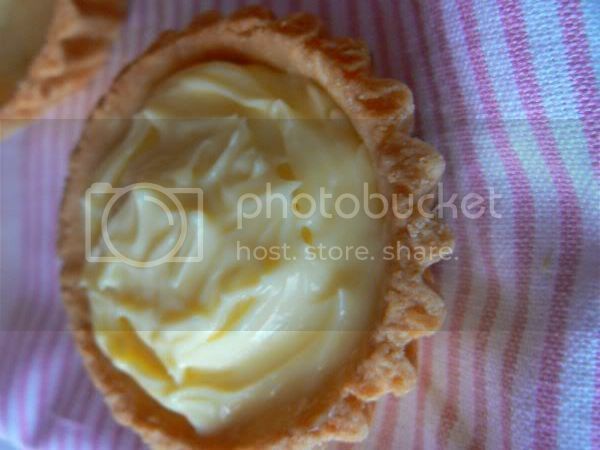 For the mini tart shells, I had found them at the bake shop namely Guten Braun at Seapark, Petaling Jaya. They're made from ground almonds and a steal since they cost only 60 sens each. Tastewise, they weren't as light as my home made one. However, they're really handy if you can't be bothered to make the tart shells. 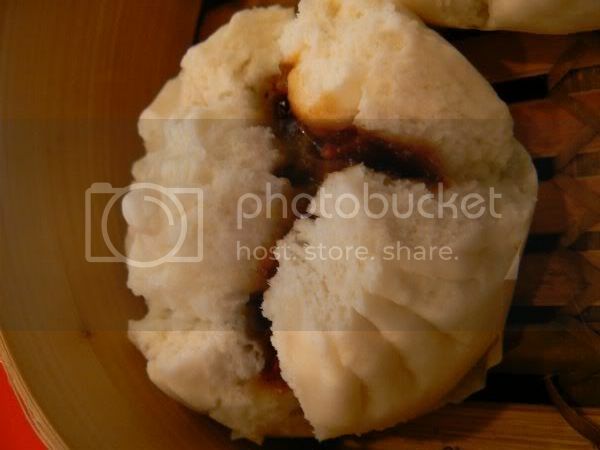 As the recipe uses American measurements, try GourmetSleuth to convert. It's pretty accurate as measurements differ for each ingredient. On another note, for those of you who love food reviews, take note that from July onwards, I will be posting during the weekend together with the Weekend Cat Blogging entries. 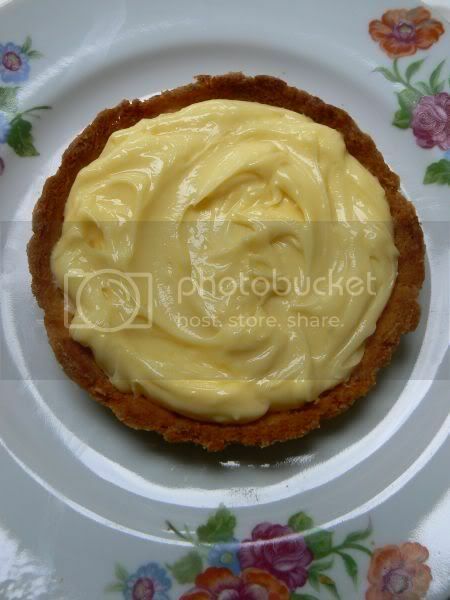 Have a great weekend and if you have time, make this Lemon Cream Tart a weekend project. Have an instant-read thermometer, a strainer and a blender (first choice) or food processor (I used a blender for this recipe) at hand. Bring a few inches of water to a simmer in a saucepan. Set the bowl over the pan, and start stirring with the whisk as soon as the mixture feels tepid to the touch. Cook the lemon cream until it reaches 180 degrees F. As you whisk—you must whisk constantly to keep the eggs from scrambling—you'll see that the cream will start out light and foamy, then the bubbles will get bigger, and then, as it gets closer to 180 degrees F, it will start to thicken and the whisk will leave tracks. Heads up at this point—the tracks mean the cream is almost ready. Don't stop whisking or checking the temperature, and have patience—depending on how much heat you're giving the cream, getting to temp can take as long as 10 minutes. Put the flour, icing sugar and salt in a food processor and pulse a couple of times to combine. Scatter the pieces of butter over the dry ingredients and pulse until the butter is coarsely cut in—you should have some pieces the size of oatmeal flakes and some the size of peas. Stir the yolk, just to break it up, and add it a little at a time, pulsing after each addition. When the egg is in, process in long pulses—about 10 seconds each—until the dough, which will look granular soon after the egg is added, forms clumps and curds. Just before you reach this stage, the sound of the machine working the dough will change—heads up. Turn the dough out onto a work surface and, very lightly and sparingly, knead the dough just to incorporate any dry ingredients that might have escaped mixing. To partially or fully bake the crust: Center a rack in the oven and preheat the oven to 375 degrees F. Butter the shiny side of a piece of aluminum foil and fit the foil, buttered side down, tightly against the crust. 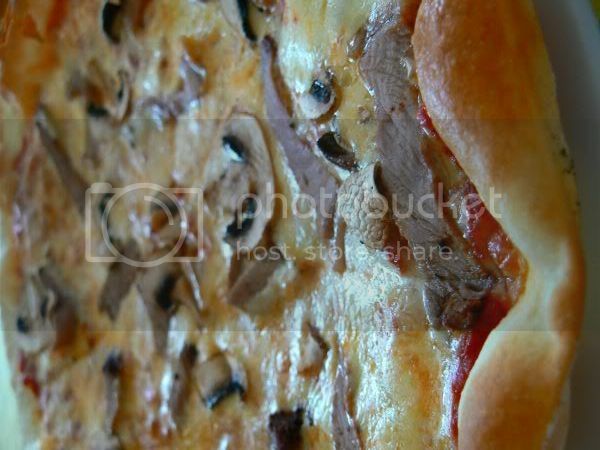 (Since you froze the crust, you can bake it without weights.) Put the tart pan on a baking sheet and bake the crust for 25 minutes. Carefully remove the foil. If the crust has puffed, press it down gently with the back of a spoon. For a partially baked crust, patch the crust if necessary, then transfer the crust to a cooling rack (keep it in its pan). I always get hit with a load of memories when I think of Chinoz since it was one of those places I used to hang out at when they were in Bangsar long long ago. Originally starting out at the shoplot where Sri Nirwarna Maju is now located, it was THE place to dine. 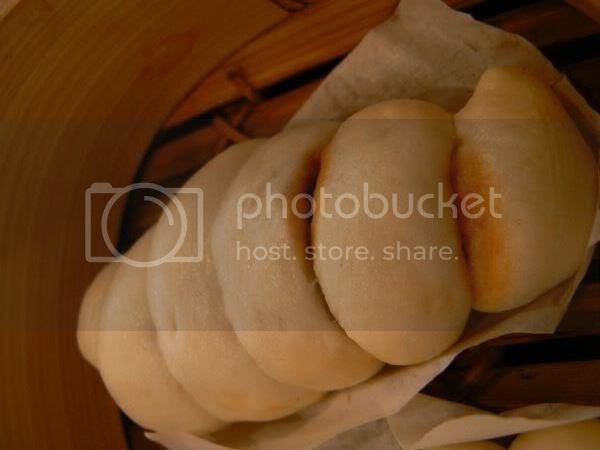 I still remember the bread which they served in tiny bamboo steamers. My friend absolutely loved the butter and would always ask for more. 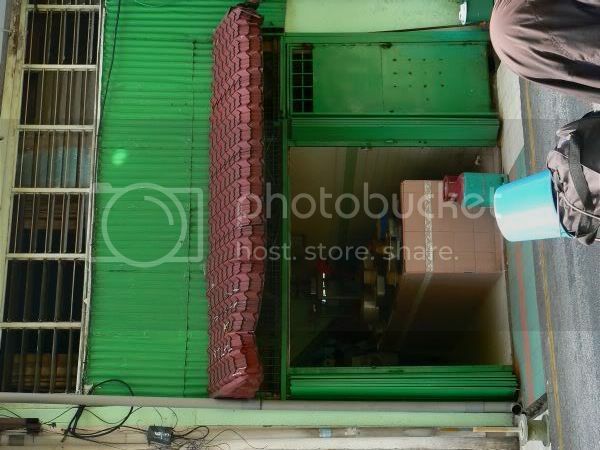 Then they shifted up to Jalan Telawi 5 near Finnegans where they occupied two shoplots - upstairs and downstairs. Food was still good and I remember the amazing appetizer buffet spread they had. Upstairs were posh private dining rooms where we had a party once. Not sure what happened but they closed that down and focused on their Suria KLCC outlet. This outlet used to be quite a fun place since it was located at such a strategic place and great for drinks and a quick bite. Now it's all modern and stark - totally unlike the previous Chinoz on the Park which felt warmer and friendlier. Even the menu has changed and the focus seems to be on their seafood bar with Japanese items like nigiri sushi, makis and sashimi. There's also crudo - the Italian version of sashimi whereby it's served with oils and dressings for instance tuna with hazelnut oil. We weren't in an adventurous mood that day hence we focused on staples like pizza and pasta. There's also tapas (small dishes) which caters for the drinking crowd. We ordered the Turk (RM32++) pizza and the Fettucine Marinara (RM38++) to share. 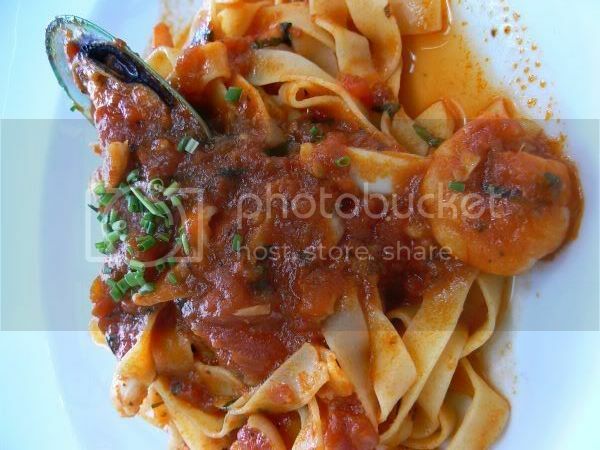 The pasta was nothing fantastic - just seafood like green lipped mussel, scallop, calamari and prawns mixed with tomato sauce. You can opt to have the seafood with olive oil or even cream sauce if you fancy. The pizza was pretty interesting and tasty. 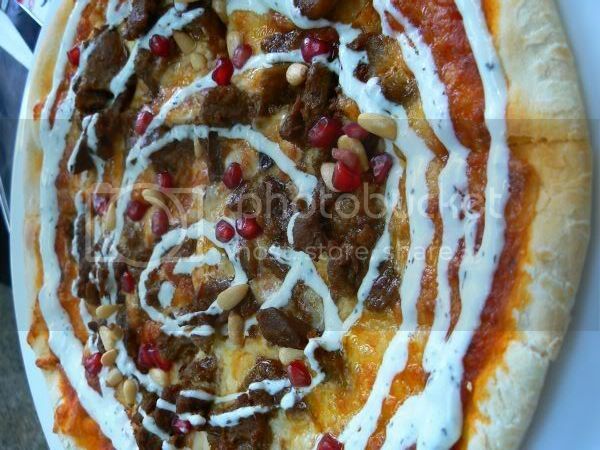 It came topped with slices of curried lamb, sprinkled with pomegranate seeds and pine nuts with a drizzle of yoghurt. Although we liked the pizza versus the pasta, we couldn't help comparing the lamb slices to beef rendang. No desserts for that day since Splashie Boy had to rush back to work but I did check out the dessert counter which looked so like the one in Singapore's Marmalade Pantry. The counter is quite strange as it's tucked in one small corner far away from the service area. I spied items like Red Velvet Cupcakes and etc which kinda reminded me of the cupcakes Lyrical Lemongrass featured before in her blog. I wonder if they were made by the same person or the restaurant just has a baker who likes the Magnolia Bakery Cookbook. Prices here are kinda on the higher side but then I guess it's to do with their premium location as the view from outside is great. We sat outside looking at the skyline under billowing fans and it was pretty nice especially with the direct view of the fountain in the KLCC park. Sometimes it amazes me what you can stumble onto if you follow your instinct. Although Taman Bukit Maluri is relatively near my place, I must admit I rarely wander that direction. It's really easy to get here especially if you use the highway, Lebuhraya Damansara Puchong. This particular area houses the famous Tuck Kee Dim Sum but since it was late afternoon when I was here, Tuck Kee had not opened for business yet. Instead following the crowd of people around this stall right next to a car workshop, I discovered yummy pan meen. Although I wanted the dry version since it was such a super hot day, I noticed that everyone's preferred choice was the soupy version. 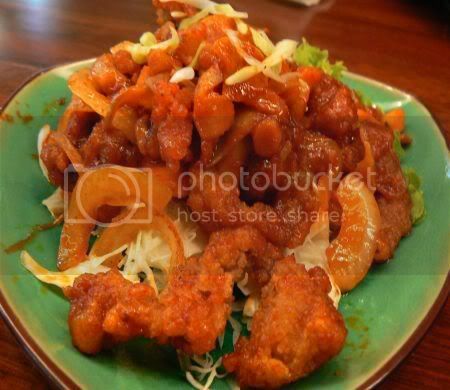 A small portion (as seen above) comes with a very generous topping of minced meat, vegetables and crunchy ikan bilis. The noodles which is made by hand and rolled out in a small pasta machine was al dente. 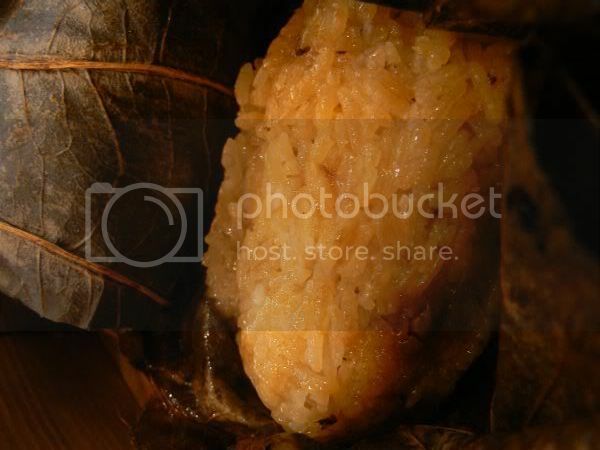 Served with cekur manis leaves in the broth, it was extremely good plus value for money. A small portion only costs RM3.20 while a big portion is RM3.70. 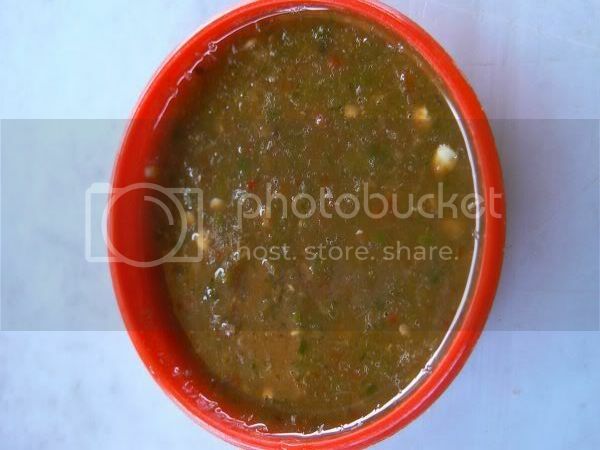 I also liked the chili sauce which came with the pan meen that was spicy with grinded green chilies. This stall also serves Curry Noodles and you can opt to also eat your pan meen noodles with the curry broth. 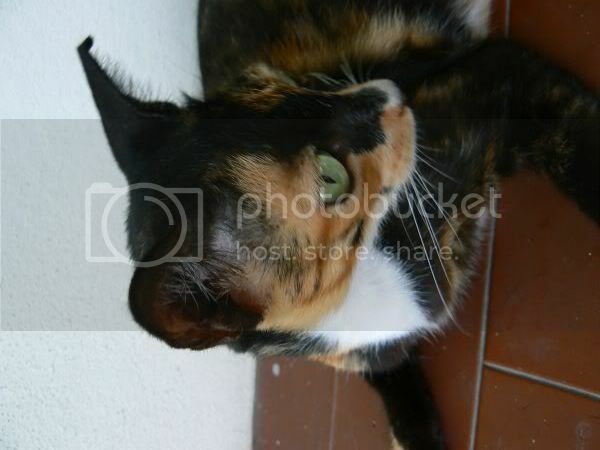 I'm often at the Taman Tun Dr Ismail area since that's where the pet shop we get our kitty supplies is located. Every time I'm there, I notice a van packed opposite the KFC which sells fruit rojak and tofu bakar and is run by a Chinese couple. Now on days when they're not around, instead it's just a man with a motorbike stall selling fruit rojak. According to my sources from the pet shop, this man is actually the father of the lady who usually sells from the van. 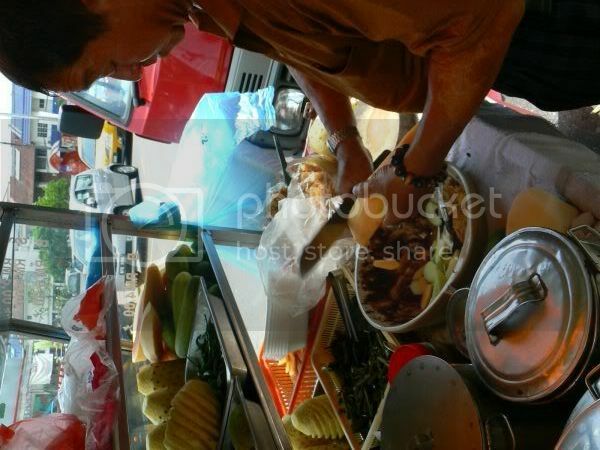 Whenever she's on her off day which is Thursday, he steps in and sells rojak. I've tried the daughter's rojak before which was pretty good stuff but after you taste her dad's rojak which is the original recipe, it pales in comparison. Here at his stall, he uses a different method - instead of pre-cut fruits and vegetables, he slices them as and when you order so they're not dried out. 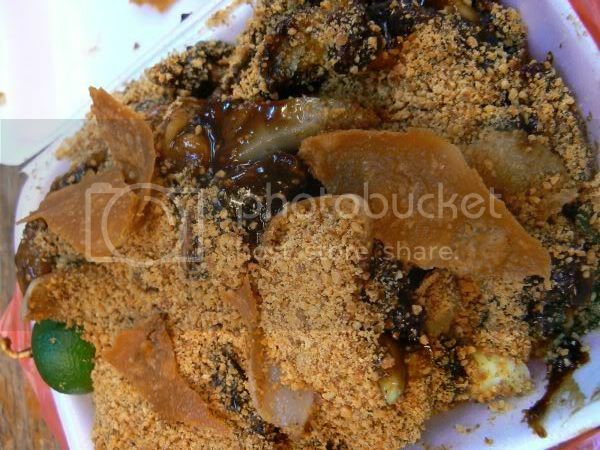 What is most important is his rojak sauce which is so much thicker and aromatic compared to his daughter's rojak sauce. We reckon she doesn't make it as thick since it's more cost effective for her business. For this version, it was the ultimate one at RM5 which came full of blanched brown sotong, tiny grilled sotong, blanched kangkung (water spinach), chopped pineapple, cucumber, papaya with crunchy yau char kuai slices. Coupled with his thick rojak sauce, a sprinkling of crushed peanuts and a dash of calamansi lime juice, it was absolutely delicious. Do give it a try the next time you're around this area on Thursday or if you're lucky to spot him around. Aside from laksa, this particular stall within the funnily named Chicken Cuisine (their logo had a chicken with a serving tray versus it being served on a platter!?) 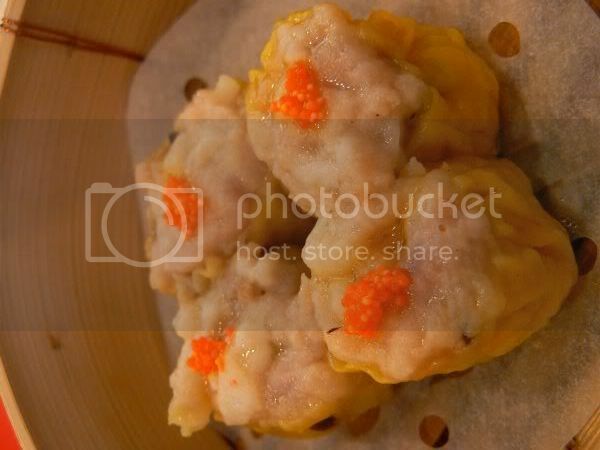 also serves yong tau foo. 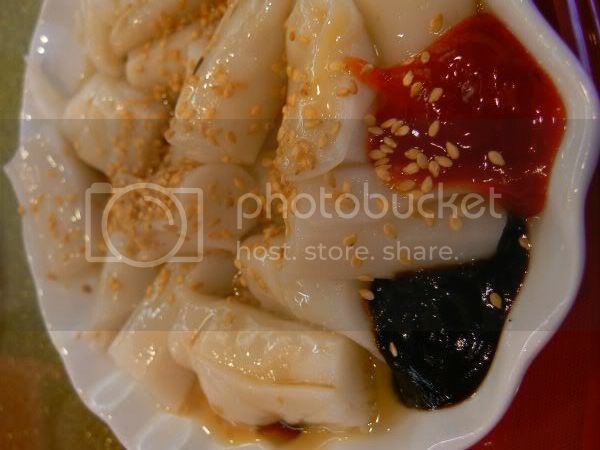 You pick and choose what you wish to eat from trays of ready made yong tau foo and they'll prepare the chee cheong fun for you straight away. If these items are not to your fancy, why don't you just head up the road for the Meng Kee Char Siew instead. Sorry we're super late for WCB this weekend but Ms. G who usually poses like a super model for me decided no go yesterday with the heat we have been experiencing. She was all "No! No! No pictures today! I'm not in the mood" hence this side profile picture of her. Guess she got a bit tired of me sticking a camera up her face. Remember how I mentioned she's a fussy eater. I managed to resolve all those problems as we discovered she loves a particular brand called Fussie Cat. It must be chock full of goodies as she can wolf down a small can of it in a matter of minutes. It's her favourite especially the chicken flavour which she must have daily together with her usual kibbles. Do visit Scampy who's the super hero and the rock star at Scamperdude.com as they're hosting WCB this weekend. Lots of adorable kitties joining them too. It's been a while since I baked or took part in a blog event! Life kinda caught up with me hence I abandoned my oven, pots and pans for a while. Just to make sure I had a great excuse to start baking again, I equipped myself with new toys - a mixing bowl, spatula and whisk from CuisiPro. This month for Sugar High Friday, the Domestic Goddess started talking about cravings and the one dessert you really want to make. I know it is super lame but honestly I only crave for chocolate. It's what keeps me sane during that "time of the month" and my preferred choice whenever I scan any dessert menu at a restaurant. Another strange habit of mine is I love my chocolate really bitter. Not all people like it that way so usually whenever I make desserts, it's only Splashie Boy and I who relish it. Somehow I find it more virtuous to consume loads of bittersweet chocolate versus the sweeter variety. 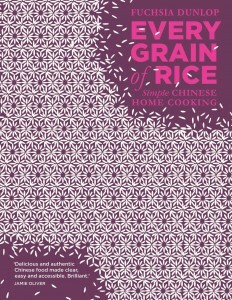 Since I had bought Dorie Greenspan's new cookbook, Baking from my Home to Yours, I was eager to try something from it. I zoomed in on her Chocolate Chocolate Cupcakes straight away. 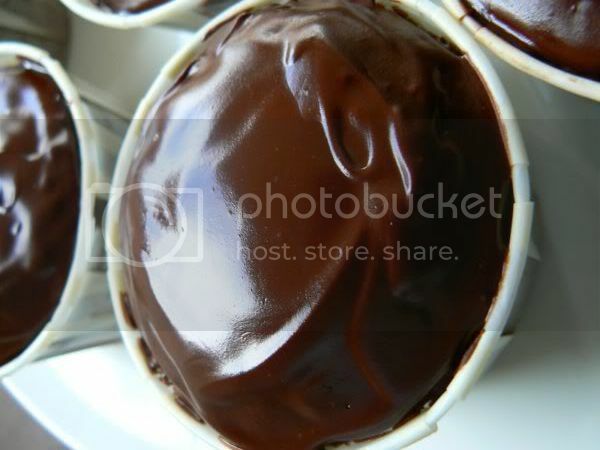 It's extremely chocolatey with cocoa powder and melted chocolate in the batter plus a shiny chocolate ganache topping. When you take a bite of the cupcake, the rich aroma of the chocolate will hit your nose giving you a slight "cocoa high". The other best part of this cupcake is it doesn't have that acidic taste from the baking powder and soda bicarbonate which seems to be found in most chocolate cakes. Another plus point about this recipe is how simple it is to make the cupcake and the ganache. For my ultimate crave, I used Valrhona Guanaja (70%) and my newly acquired Valrhona cocoa powder. Getting Ready: Center a rack in the oven and preheat the oven to 350 degrees F. Fit the 12 molds in a regular-size muffin pan with paper muffin cups, or butter them with flour and tap out the excess. Whisk together the flour, cocoa, baking powder, baking soda and salt. Working with a stand mixer, preferably fitted with the paddle attachment, or with a hand mixer in a large bowl, beat the butter at medium speed until soft and creamy. Add the sugar and beat for about 2 minutes, until it is blended into the butter. Add the egg, then the yolk, beating 1 minute after each addition and scraping down the sides and bottom of the bowl with a rubber spatula as needed. Beat in the vanilla, then reduce the mixer speed to low and add half the dry ingredients, mixing only until they disappear. Scrape down the bowl and add the buttermilk, mixing until incorporated, then mix in the remaining dry ingredients. Scrape down the bowl, add the melted chocolate and mix it in with the rubber spatula. Divide the batter evenly among the muffin molds. Bake for 22 to 25 minutes, or until the tops of the cakes are dry and springy to the touch and a knife inserted into their centers comes out clean. Transfer the muffin pan to a rack and let the cakes cool for 5 minutes before unmolding. Cool to room temperature on the rack before glazing. It's been a while since I dined at Max! Kitchen and Wines. Since I was in town for an errand, I decided to drop by on the proviso I could get parking right in front of the restaurant. I guess I got lucky as I scored a space after the second round around Jalan Alor and Tengkat Tung Shin. It was good to catch up with Max and to chat about his new ventures. Food was as good as ever. I had the set lunch which is now RM22++ with an ice lemon tea. Although he was serving a red lentil soup, I went for the salad - a mixed frisee and lettuce drizzled with balsamic and olive oil that had chardonnay vinegar marinated anchovies, feta cheese cubes and olives. 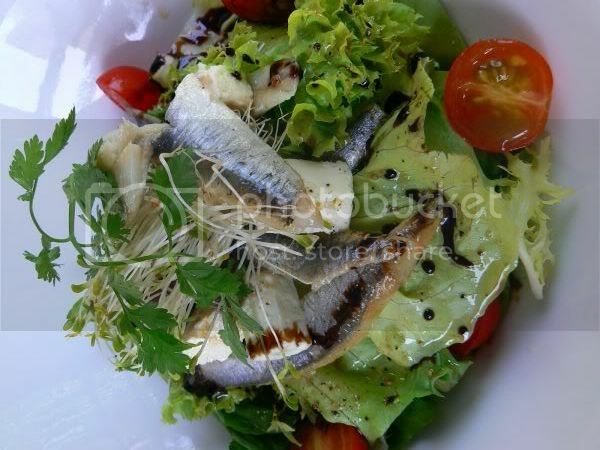 I really liked the anchovies which is a far cry from their tiny ikan bilis cousins from Malaysia. 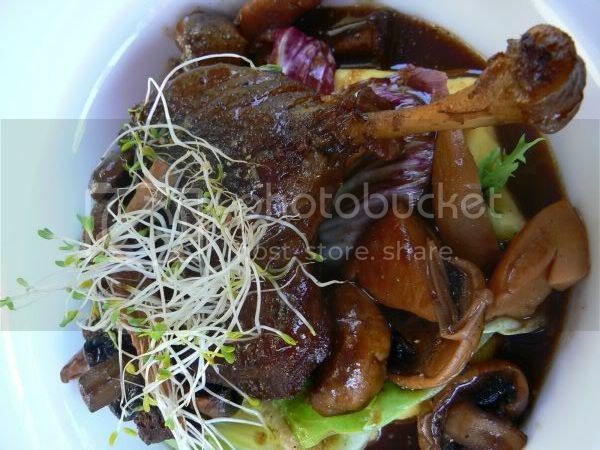 For mains, I had the braised duck leg served with polenta mash and mushroom ragout. I was fascinated with the mix of mushrooms as I spied chanterelles, a morel, button and shitakes. If you're around the area, do drop by as the set lunch is really worth it - very satisfying meal for that price. Here's another part of Petaling Jaya which I never knew existed until I recently read an entry on Vincent's Waisikkai. 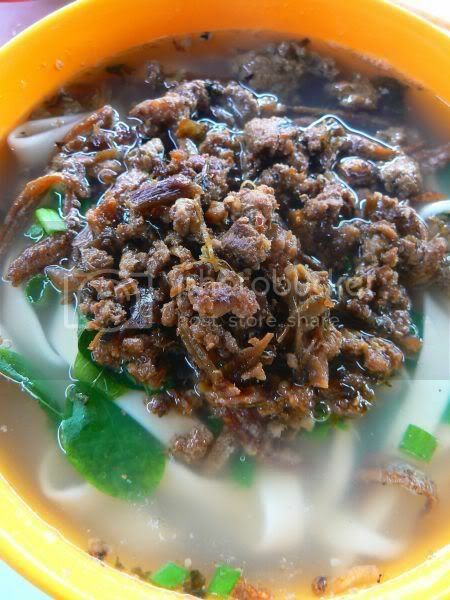 Although I'm familiar with Sungai Way for Ah Sang Bak Kut Teh, the market and the area surrounding it, I was astonished when I read Vincent's entry on a place to eat within the village. Armed with my handy roadmap (I didn't have Splashie Boy's superwoman GPS who sweetly tells you which turns to take to reach your destination that day), I found this place quite easily. One thing that struck me about the surrounding area was the roads are super narrow (they're one way streets) and there were so many Indonesian stalls around. With signs proclaiming they sell Minang food, Bakso, Pecal, Lontong and etc, you will think it's actually Kampung Baru. I guess due to the proximity of the village to the factories means there's now a high number of Indonesians residing here. Once you get your bearings right, it's pretty easy to get here. 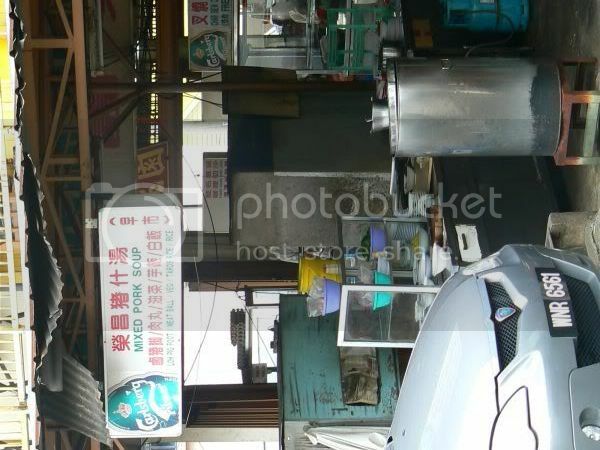 Although the restaurant does not sport any signboard, you will see the Mixed Pork Soup sign and the huge metal container used to boil the pork soup. An old man runs the stall together with his young helper. 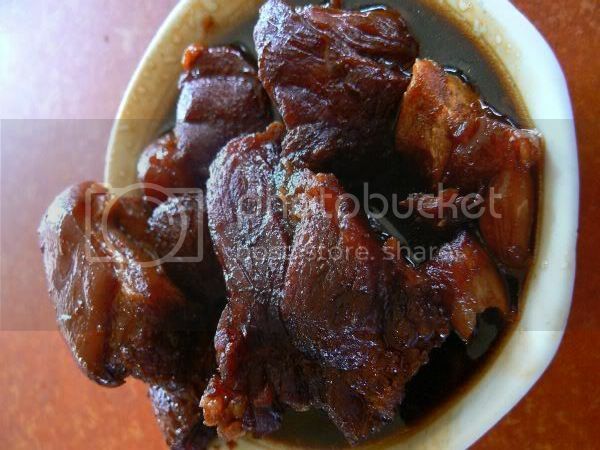 Remembering what I read from Waisikkai, I ordered the works - stewed pork trotters, mixed pork soup and yam rice. 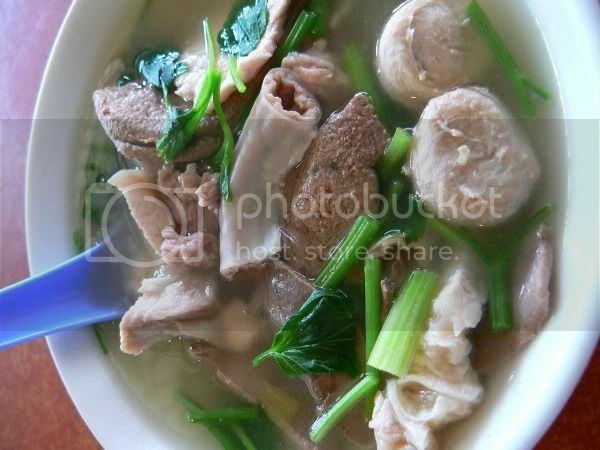 The mixed pork soup was my favourite. The bowl came chock-full with all parts of the pig like the stomach, liver, lung, intestine, belly plus pork balls. I really loved the tiny pork balls which were tender and mixed with bits of dried cuttlefish giving it additional aroma. Served with lots of coriander and chopped preserved vegetable (ham choy), the soup was slightly peppery. 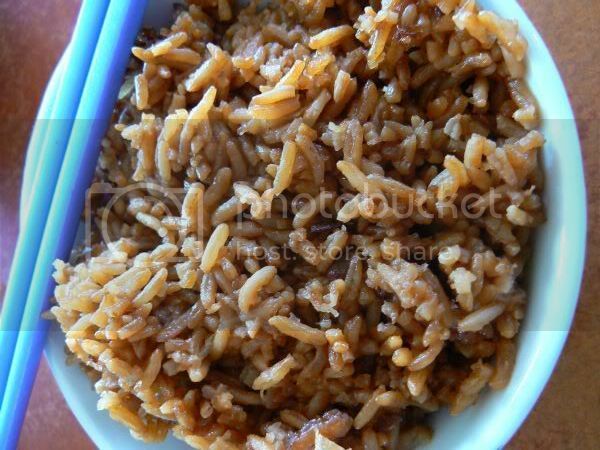 The yam rice was aromatic with chunks of soft yam and dried prawns that went really well with the mixed pork soup and the gravy from the stewed pork trotters. Although the pork trotters' gravy was quite full of flavour and thick, I didn't like the fact it was full of lean meat. I guess next time if I revisit this place, I will have to ask him to give me the trotters rather than the lean parts. Pricewise, this place is great value for money. 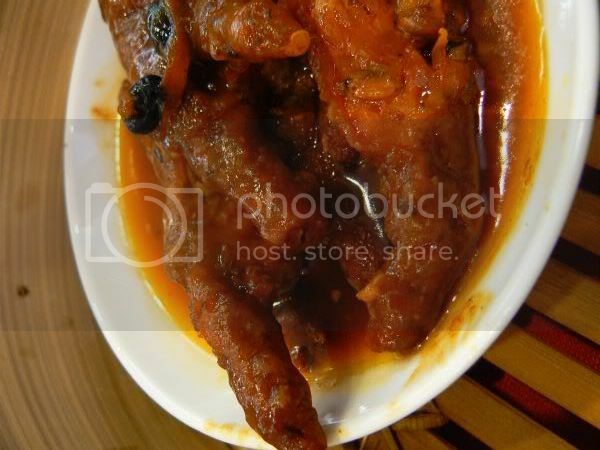 An order for mixed pork soup and yam rice is RM4 while the stewed pork trotters is about RM4. The place also serves char kuey teow and chicken rice. Apologies again for another post on prawn mee and curry mee but I was around this area very recently hence I decided to search for it. I must admit I never knew this place existed hence I was curious to check it out. 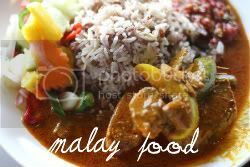 This place is a haven for food - there's malay and indian selections at the medan selera and chinese food at the zinc roof side. Across the road, there's more items with an economy rice stall which was quite popular during lunch time. This particular stall next to the mamak stall is run by an old couple and their son (I think). The husband is the one doing most of the work with the wife helping out and the son serving the noodles to the customers. Although the food isn't as good as other places, what amazes me is the prices they charge for their noodles. A small bowl is only RM3 while a large bowl is RM3.50. Both the noodles I had at seperate occasions are the small bowls and they were generous with their portions. The prawn mee comes topped with sliced prawns and pork plus lots of deep fried shallots. Even though the stock is not as fragrant as compare to Yong Len in Taman Tun Dr Ismail, it's still a pretty satisfying meal. 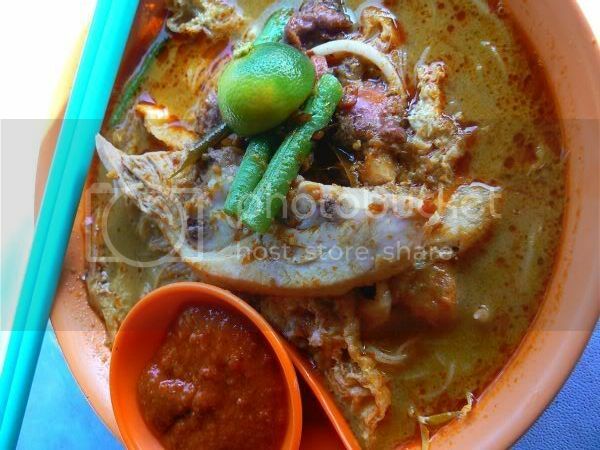 They also serve delicious Curry Mee which is only available on Tuesday and Friday. The noodles is served with a piece of chicken, cockles and vegetables. It's not too creamy nor as rich tasting compared to the other places. Usually the customers add their favourite ingredients whether it's chicken or cockles to the noodles. Even the drinks at the next door mamak stall are very reasonable - one small glass of teh tarik is 90 sens so you definitely can get a pretty substantial meal for less than RM5 here including your drink. Although Sushi Groove sounds like it's from an Austin Powers movie with all the groovy references, it is a far cry from it. Decked out in an interior which is quite dark and gloomy with a few lights and lots of green everywhere, it looks more like a bar rather than a restaurant serving Japanese food. Strangely enough it's not even Japanese in origin but Indonesia. When you walk through the door, instead of the usual Japanese greeting of hello, here they herald your arrival with the word - "Groovy" which signals to all the wait staff to greet you hello. Depending on the availability of tables, you either get to sit at the individual tables at the side or share the huge communal bench tables with others. When this place first opened, it was packed with people all eager to check out a new place in the mall which also offered a 20% discount. We ate here twice, once when it first opened and it was obvious how they struggled. Management was running around helping out with orders hence the service was brisk and friendly but the kitchen was slow in churning out the food. Then for a while they closed for business and only opened at 5pm daily citing renovation works needed. Now they have fully opened but with a limited soft opening menu. According to their wait staff, their full menu will only be available once they have their grand opening which is after July 1st. The menu consists of sushi with quite an emphasis on various types of makis, small plates which are appetizers and salads, various types of rice and noodles and dessert. For the more conventional eater, there's nigiri Sushi or sashimi slices. I ordered the Salmon Sashimi (RM13.90) which came with five thick slices. 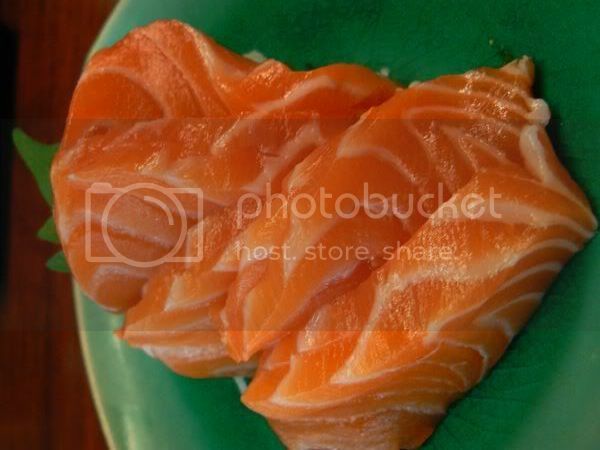 Although it looked pretty good, I realised after eating my first slice of salmon sashimi that it was a bit too chilly. After a while, I realised that they had obviously pre-cut the sashimi slices and placed them on a plate in the fridge since the plate holding it was cold. This was to cut down the wait time in slicing the sashimi in the kitchen. Then it was the Krakutua Roll (RM9.90) which was stacked up to resemble a volcano with it's lava flowing down in the form of a sauce. 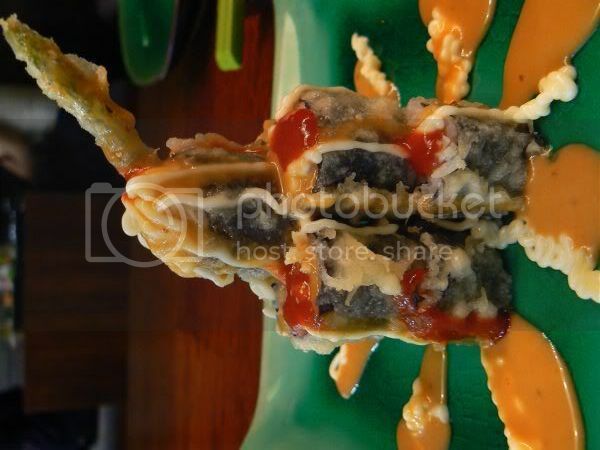 Filled with gindara and asparagus, the rolls were deep fried before being slathered with the special mayo sauce. Not too healthy but quite tasty. The red sauce was chili which added a kick to the roll. 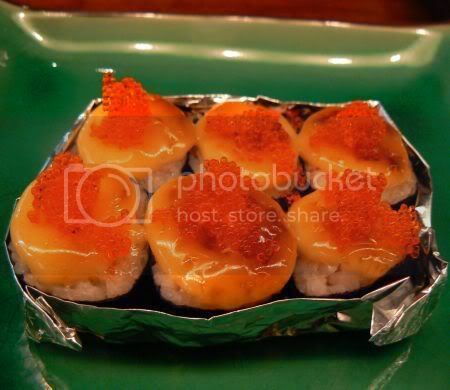 Their spicy mayo sauce gets used in quite a few of their sushi dishes like this one, the Mayonnaise Dream Roll (RM9.90). Filled with crabmeat, salmon and carrots, it's topped with the mayo sauce with a bit of ebiko and baked in the oven for a short while. I quite liked this one as it was pretty tasty. 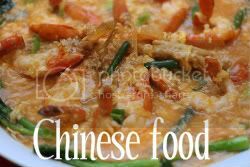 For something more substantial, go for their rice and noodles dishes. 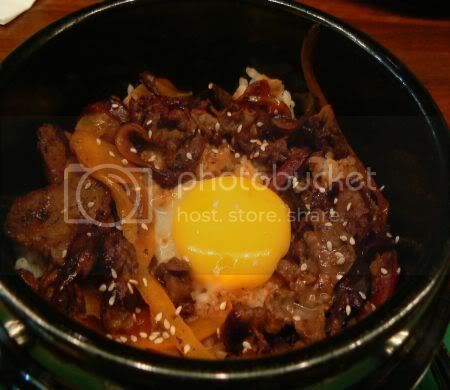 Splashie Boy had their Yakiniku Bibimbab which was served with slices of beef, an egg and rice on a hot stone bowl. He said it wasn't too fantastic and he preferred the one served at Bonjuk. I wanted to try the Yakuza Fried Beef but I must admit it didn't look too appetising also when it reached our table. 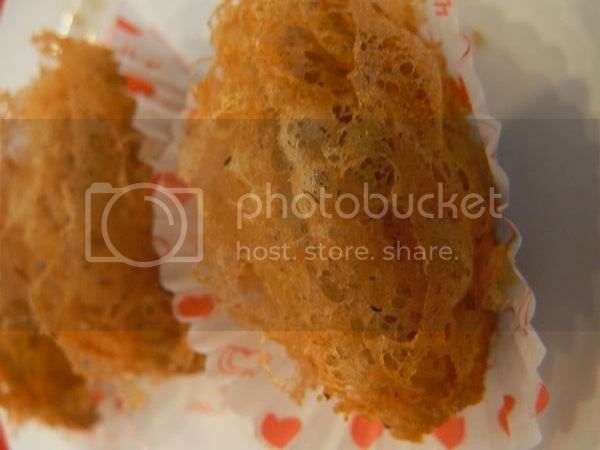 The fried batter was soggy and the sauce they tossed it in was quite sweet and spicy. Not one of their better dishes. I also had their Crispy Chicken Skin Salad which I didn't snap a picture as it was just a few pieces of lettuce, thin pieces of crispy chicken skin and a generous topping of bonito flakes. Although everything was super crispy, I didn't really like the soy sauce dressing which was slightly too salty. Overall, I thought the food was not bad but definitely not pure Japanese but more fusion. It's a lot of deep fried items and usage of mayo sauce which is not too great for one's waistline. The soft opening menu is kinda dismal with their choices especially after you have seen the full menu which is so much better. Hopefully they get over their problems like service with the limited menu choices. The only thing I kinda didn't like was sharing a table with everyone else as things got quite cramped. The only good thing about it was I got to see what other people ordered from the menu. It's the weekend so kitties rule! 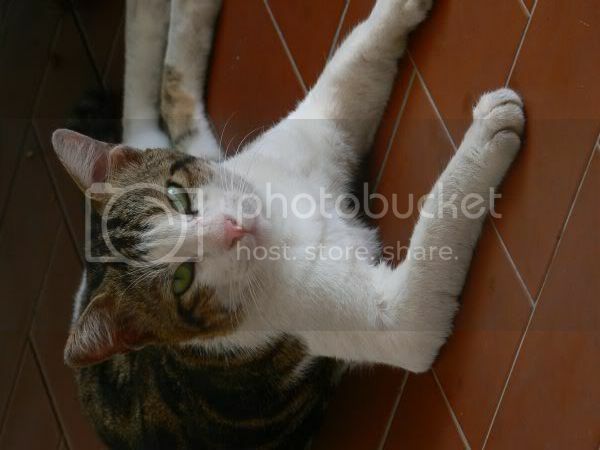 This time round, I managed to snap a nice picture of the stray cat who comes over to the house regularly to eat. He's a bit of a terror as he always picks fights with everyone. Whenever he is around, the cats get all defensive and run off. Sometimes, I also get pretty upset with him especially if he crosses the line and attacks one of the cats. Usually it's a bucket of water I splash at him to tell him NO! As the months go by, he's getting tamer and not so jittery hence it is also easier to snap a nice picture like this one of him chilling out. Puddy and Kate from A Byootaful Life is hosting WCB this weekend so expect lots of antics from Puddy and the other kitties. It's Friday so let's all party this weekend. We're due to catch the new movie - Fantastic Four and the Rise of the Silver Surfer so that should be good. Hope I can get tickets for it today or else it will be a super boring weekend. On to the food which is what all of you tune in for on a daily basis. This time round it's Indian food which is popular among those who work around the Jalan Raja Laut and Jalan Tuanku Abdul Rahman area. This no signboard place is actually called Santa Chapati. Although they have another outlet in Jalan Tun HS Lee, it's this particular one which serves the best food. 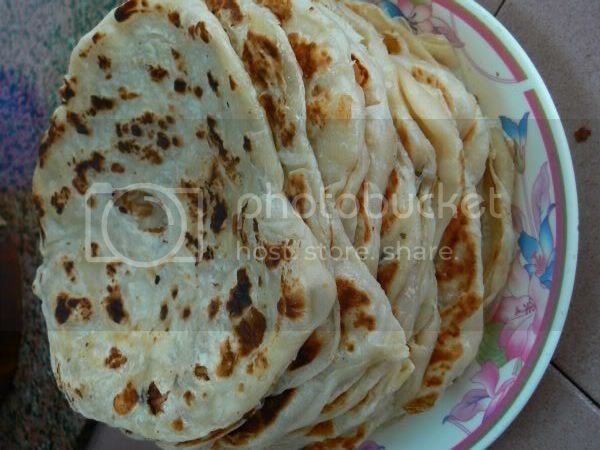 In the mornings, it's roti canai (70 sens) which is crispy. I really like the texture of this roti canai as it reminds me of the crispy ones I get at Raju's. Only thing is they pre-cook the roti canais and it's served to you slightly cold. The star of this place is of course their chapati (RM1) - really fluffy with the slightly crispy tops. There's a man in front of the restaurant making these constantly and you pick one from the basket. 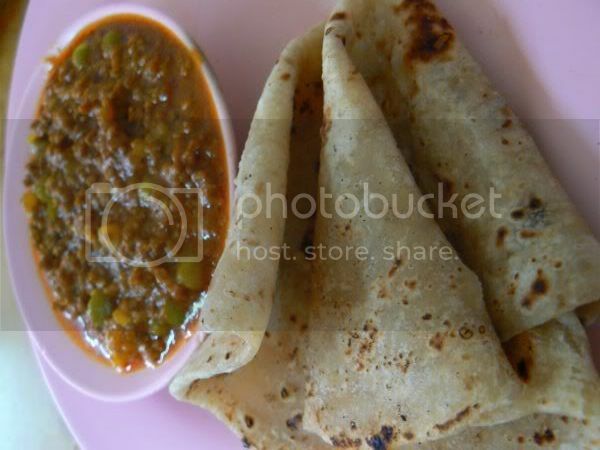 You can eat your chapati with their keema or dhal. Both are equally good but I prefer the keema. If you're vegetarian, you can opt to eat your chapati with bean sprouts and tofu. Their dhal is extra thick here and cooked on a daily basis. It's so popular that they use a gunny sack of lentils every day. During lunch time, their curries with rice is also popular and most people go for their Mutton Masala. The restaurant is quite small so you'll need to share your table with others which gives it a nice communal feeling. 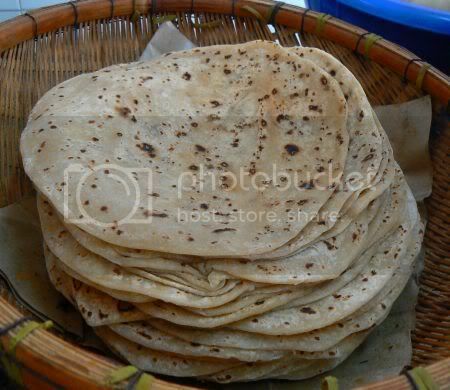 I was also told that this chapati is a favourite of our Prime Minister. Although he doesn't visit this place anymore, he does request for it to be packed back to his residence. 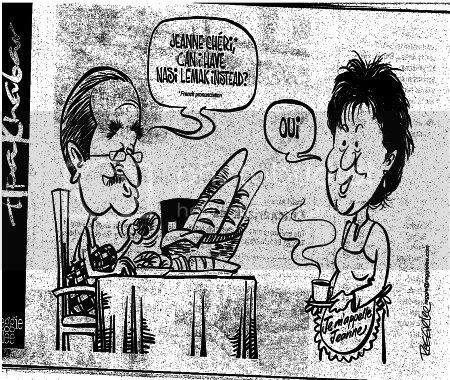 I've attached a scanned copy of a cartoon by Reggie Lee depicting him with his newly wedded wife talking about his breakfast choices. Published by the Star yesterday, it's so appropriate to share it with all of you even though it's not nasi lemak. Rather than you think I usually end up eating good food at every place, believe me I sometimes stumble on places which just don't get along with my tastebuds at all. When I first saw Empress Cafe opening its doors to the public, I was excited since they're the old Bayou Cafe from Plaza Mont Kiara. However, when I tried the food there, I was sorely dissapointed with majority of the items ordered. In fact, I was so dissapointed, I actually visited it twice to make sure it just wasn't a fluke during my first visit. Not sure if I ordered duds from the menu but I just wasn't too impressed with the food nor their prices. 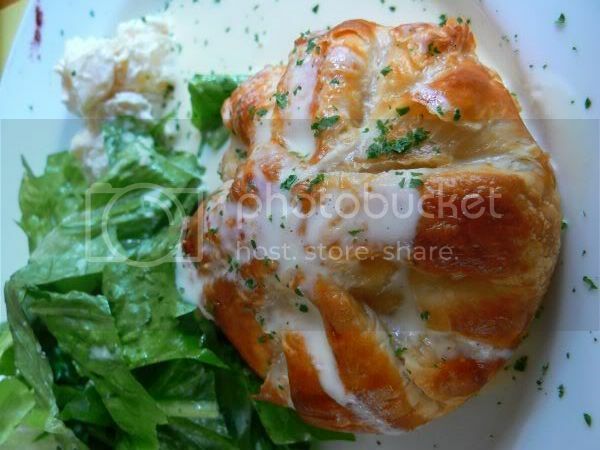 I was told that their Chicken Pie (RM18.90++) is famous hence we tried it. It takes a while to cook it as they claim it's made from scratch. 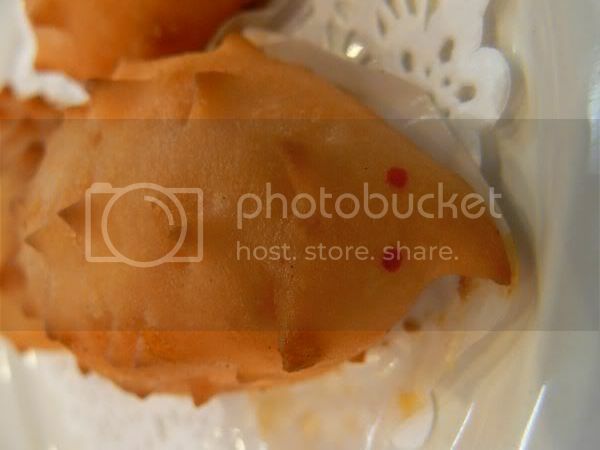 The pastry is buttery and baked to a crisp golden colour. Really nice even though I did find stray bits of uncooked pastry within. 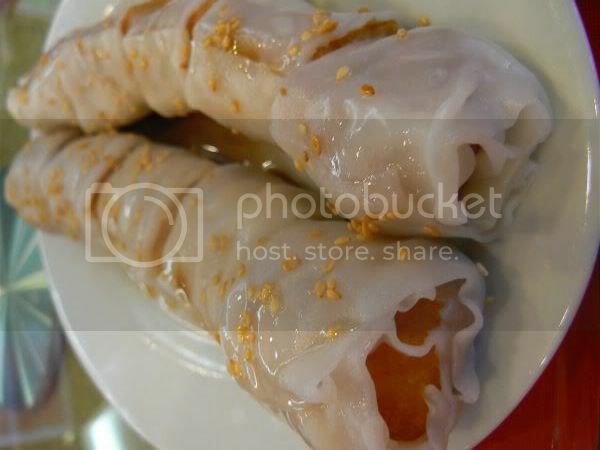 The filling was nice and creamy which came with chunks of chicken meat. Now, in the old days when they were known as Bayou, they were well known for their Javanese dishes hence we picked this Ambon Beef (RM22++). 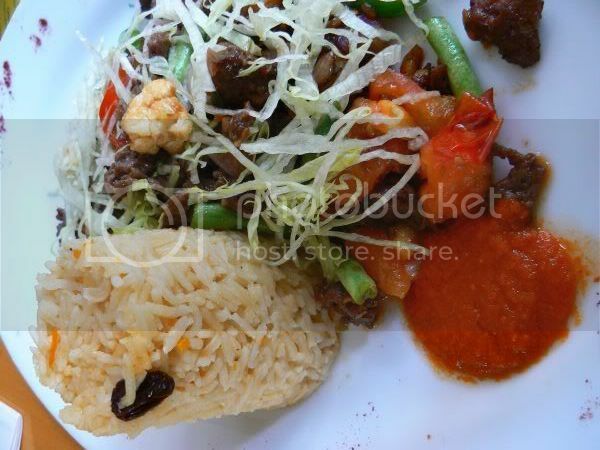 Served with a mound of rice, the beef is cut in chunks and cooked with an assortment of vegetables. Although it was a pretty good sized portion, they kinda ruined it as the serving was too sweet. Thumbs down for this particular dish. Since they had such an extensive menu filled with pastas, pizzas and asian meals, I decided to give them one last chance. This time round we sampled their pizza and pasta. 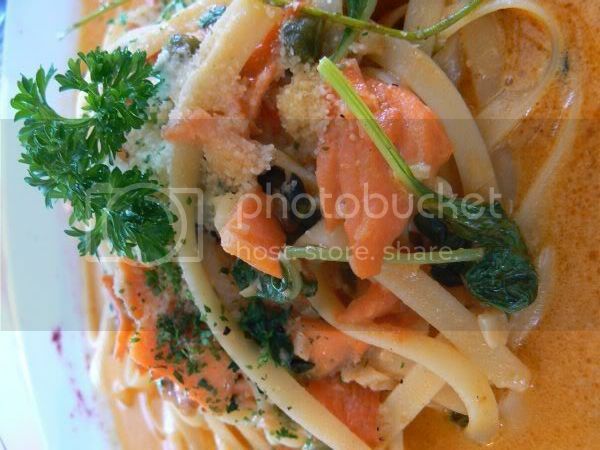 First we ordered their Fettucine Al Salmon (RM32++) which came with an technicolour orange sauce. Big mistake as instead of a citrusy and tangy sauce which was what I expected, it turned out to be cloyingly sweet instead. We fared slightly better with their Steak Pizza (RM28++) which came with slices of roast beef, mushrooms and sun dried tomatoes. Although it wasn't sweet tasting like the previous dishes we sampled, this one was kinda tasteless. Now I know why they handed us a small bottle of Tabasco sauce as they knew we would definitely need it to spice up the plain pizza. I'm not too sure if I dare venture in here for the third time as I felt the food was mediocre only even though the chicken pie was pretty good. Pricewise, it ain't too cheap either. I'm sure there are fans of this cafe out here which will scream bloody murder to me for slandering the food but bear in mind, everyone has different tastebuds. Mine just can't take too much sugar especially in savoury dishes. Sorry people but I'm kinda into laksas at the moment. 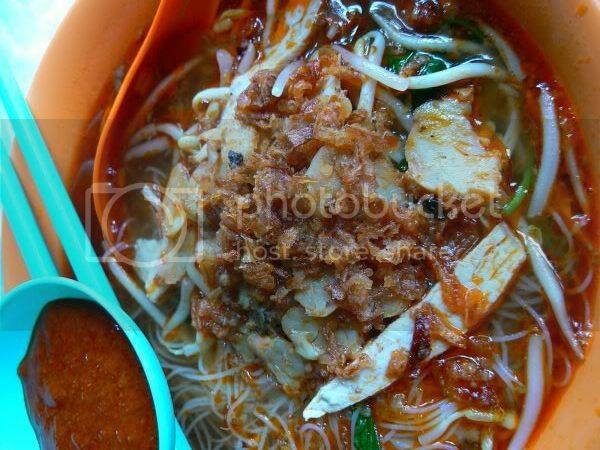 This version is called the nyonya laksa because the curry broth has a slight tang to it. It's not as rich as the usual curry laksas and the broth is thinner plus it is served with a sprig of mint. This particular stall is named after the owner - Wu-Shou Lu which literally means "Moustache Man" when translated from Cantonese. Not hard to miss him as his stall is in front and you'll see them ladling out the bowls of laksa. 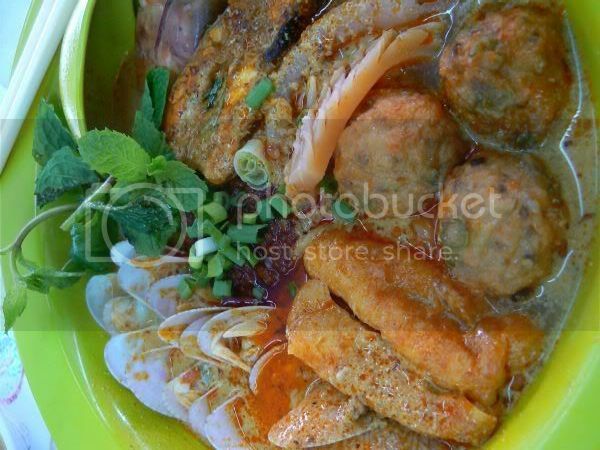 There's two versions of laksa - you can have the ordinary one with chicken which is around RM5 but this picture depicts the deluxe seafood version for a whopping RM15. It comes with slices of roast pork (siu yoke), clams like lala, a piece of curry stingray fish (ikan pari), tofu puffs, brown sotong, huge prawns and seafood meatballs. The bowl is huge so take your time to finish this extremely satisfying laksa. Last night since we had to spend a RM100 voucher for Shangri-la Hotel and it was my mother's birthday, we celebrated at Zipangu. Food was excellent albeit at premium prices. We were also lucky as we made it back home before the flood waters rose too high. Read that Dataran Merdeka was flooded. Not surprised as when we were driving back in the heavy rain, I spied a rising river level from the top of the highway. Since there was three of us, we ordered food to share. 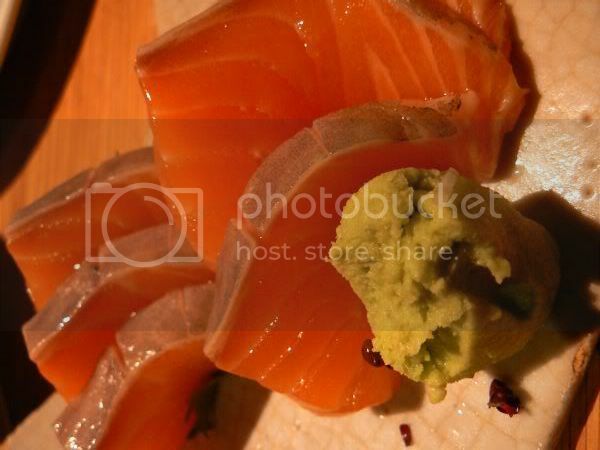 First to start off with was my mother's favourite - Shake or Salmon Sashimi (RM45++). It's a must whenever we visit any Japanese restaurants. Here they give you 6 thick slices plus one smaller slice. Really good stuff as the fish literally melts in your mouth. 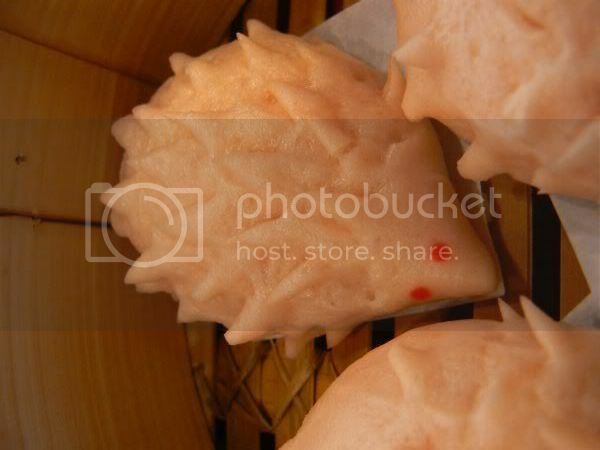 One unusual thing I spotted about this fish was it had a slight sweet taste to it in addition to the buttery softness. I ordered the Agedashi Tofu (RM15++) - a favourite of mine. This version came topped with shaved bonito flakes and chopped spring onions. Tastewise, the fried batter around the tofu was nice and thin while the soy sauce dip was not too salty. We contemplated ordering something from the wagyu beef selections but decided not after seeing the exorbitant prices. 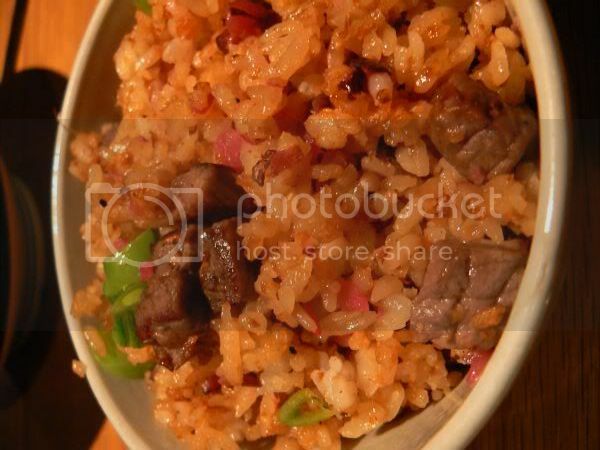 Hence we settled for a portion of fried rice with wagyu beef fat (RM21++). The rice was pretty fragrant with chunks of beef which I hope is wagyu beef. Splashie Boy polished this off and was a truly happy man. 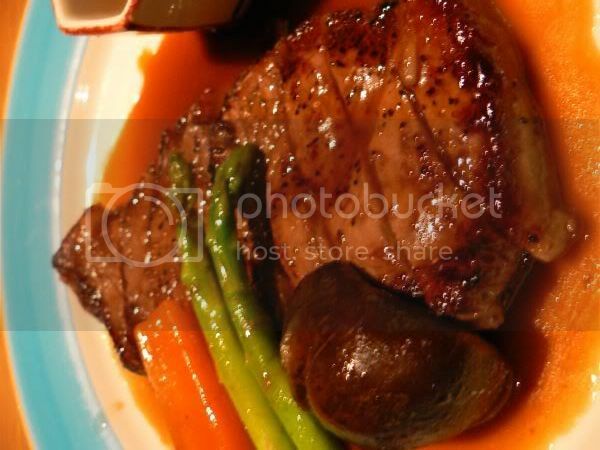 Since wagyu beef was off our budget, it was just the teriyaki beef tenderloin (RM68++). It was a pretty good substitute as the beef was cooked just right - seared on the outside with a slightly red inside. We all loved the mustard served on the side and the vegetables. 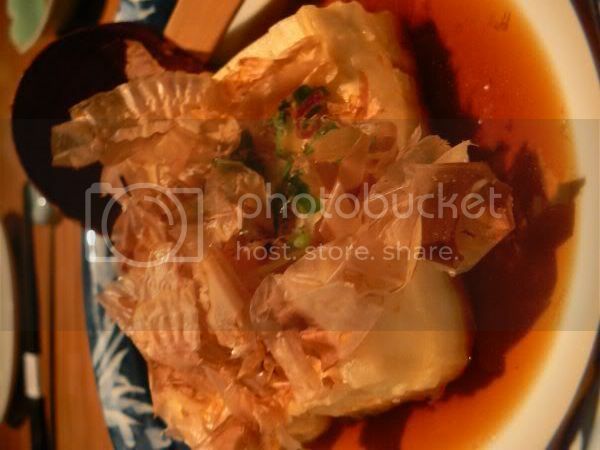 Another must order with my mother - saba shioyaki (RM30++) i.e. 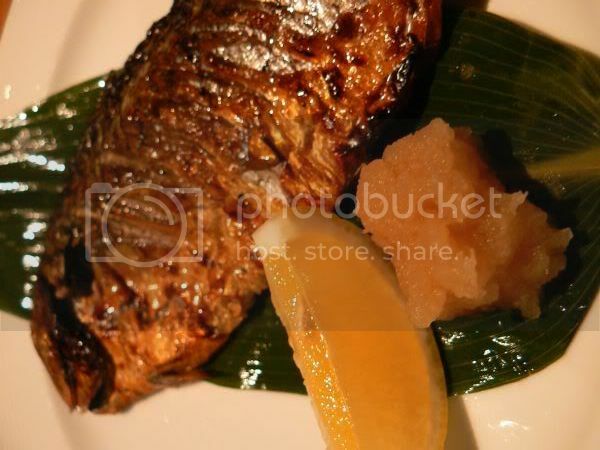 grilled saba fish with salt. I really love this fish as it was so fresh. One great thing about dining at Zipangu - you get to watch the chefs in action as their kitchen is open and glass covered. It always amazes me how no smells nor smoke will travel to the dining area as they have these huge exhaust fans sucking up the fumes. 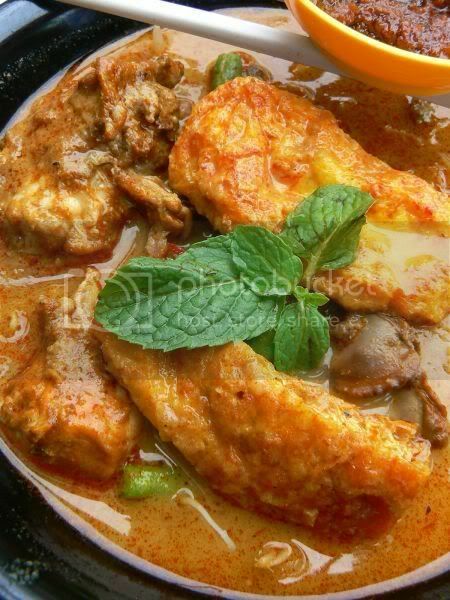 Zipangu also does Sunday buffet lunch for RM88++ per pax which is extremely popular. 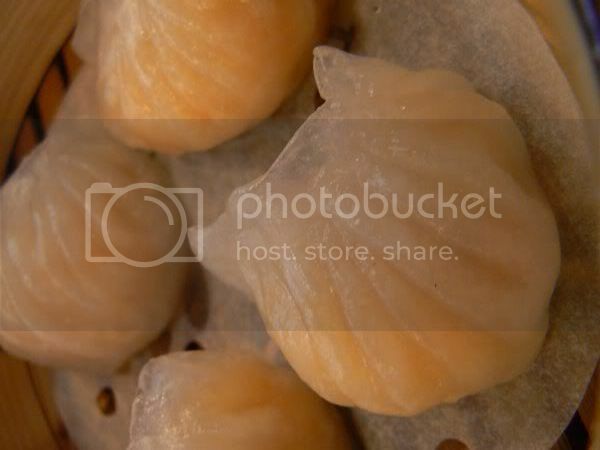 We have tried the buffet before a few years back and I remember they had really fresh scallop sashimi available. Wasn't too impressed with the cooked food though as I remember it was all pre-cooked and left in food warmers.